Supported by the “Pre-K for MA” Coalition, which is being led by Strategies for Children (SFC) and Stand for Children Massachusetts, the bill calls on Massachusetts to follow in New Jersey’s footsteps and create high-quality pre-K programs for 3- and 4-year-olds who live in underperforming school districts. The bill was filed by Representative Alice Peisch (D-Wellesley) and Senator Sal DiDomenico (D-Everett). We see the bill’s targeted, phased-in approach as getting us closer to our ultimate vision of high-quality early education for children in Massachusetts. • In 2008, Massachusetts lawmakers passed legislation that supported the concept of universal access to preschool for all children who need it. That legislation, An Act Relative to Early Education and Care, also codified into law the responsibilities of the Department of Early Education and Care as well as of its board and commissioner. • In fiscal year 2009, state funding for early education and care reached a high point. Then, due largely to the Great Recession, funding levels dropped. But from fiscal years 2014 to 2016, state budget appropriations have gradually increased. And we look forward to the day when funding once again reaches and exceeds that FY09 peak. Here at SFC, as the economy has been slowly improving, we’ve been shifting our approach. During the recession when budgets were being cut, our advocacy message was “preserve and protect.” We appealed to legislative leaders to hold the line on early education and care line items and prioritize this critical area of state investment. Now our message is that there are new opportunities for thoughtful growth. 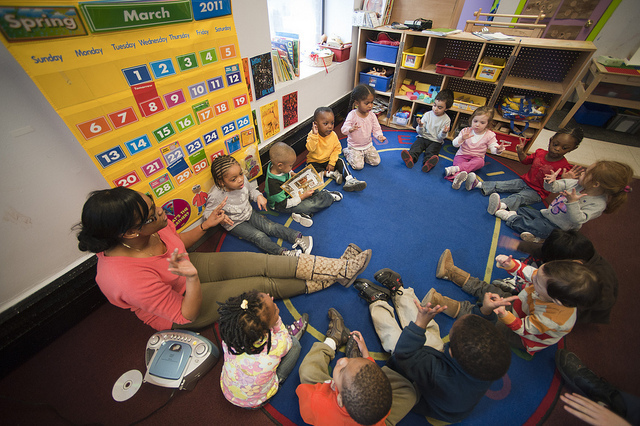 Massachusetts can – and should – make strategic investments in early education and care. Thanks to the research community, we know that early education and care programs prepare children for lifelong success. We’ve seen mayors and governors increase their investments in pre-K programs, and we’ve learned key lessons from their work. We’ve also seen state and federal lawmakers take bold stands on improving outcomes for young children. It’s time for Massachusetts and other states to take even more wise and deliberate action. That’s why “An Act Ensuring High Quality Pre-Kindergarten Education” is so important. It’s a blueprint for strategic growth. As this fact sheet explains, the proposed legislation calls on struggling school districts to develop plans to implement pre-K programs. These plans would have to be approved jointly by the Department of Early Education and Care and by the Department of Elementary and Secondary Education. Pre-K programs would be offered through a mixed-delivery system of public and private providers. And quality requirements for these programs would be modeled on federal Preschool Expansion Grant standards, including a full school day, student-to-teacher ratios of 10 to 1, and class sizes of no more than 20. Quality criteria would also apply to teachers’ credentials and compensation, evidence-based curricula, family engagement, and inclusion of children with disabilities. During the next phase, communities with Level 3 school districts would receive funding. Priority would be given to districts with lower third-grade reading performance. Level 3 schools are “among the lowest 20 percent of schools relative to other schools in the same grade span.” Districts are classified as Level 3 if they have one or more Level 3 schools. By expanding access to high-quality preschool and improving the quality of existing programs, this plan would level the playing field of quality across the mixed-provider system. Children who enrolled in these early learning programs would get the strong foundation that they need to grow into kindergarteners who are ready to learn and succeed. We think the country is on the brink of a tipping point in early education and care, and we think that Massachusetts could help by investing wisely in these programs. This could set an example for other states, ignite national change, and radically transform the lives of children.